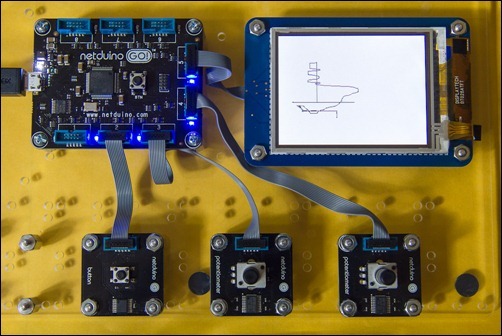 Netduino Go is designed for much more than toy projects, but one has to recognize that toy projects are fun and also great learning experiences. Today, I want to take you through the process of reproducing the behavior of a famous toy that you will surely recognize. That toy, that has helped many of us realize what poor motor skills we possess, has two knobs that control the horizontal and vertical coordinates of a pen that draws into the dust on the back of a simple screen. It’s a great mechanical device that is part of western culture. We connected the button to port 2 (but it doesn’t matter as there’s only one), the two potentiometers to ports 3 and 4, and the display to port 5. The VirtualCanvas object can be seen as the driver for the display. It’s a simple vector API, but a crucial point is that these vector drawing primitives are not executed on the Netduino. Instead, they are serialized, sent to the display and executed there. This keeps communication between the microcontroller and the screen to a minimum, and frees the Netduino main board computing power. Essentially, you have a graphics coprocessor bundled with that screen. This is also why you need to call Execute when you want a command batch to be sent to the display and drawn. I’m using DrawLine here and not DrawPixel so that the drawing looks continuous even if the potentiometers are rotated very fast. This requires remembering the previous coordinates, which is fairly simple to do. All parts used in this demo can be purchased from Nwazet.